Part of the fun of interior remodeling is getting caught up in the details. Rooms such as your kitchen and bathroom gain a better look and feel when you accentuate them with backsplash tile. In Webster, TX, My Flooring America makes it easier for you to add style and value to your property. Explore your interior remodeling options at our location, and get results that last. Your kitchens and bathrooms are busy places. You can imagine just all the water, steam, and smoke that these spaces create. All that residue and moisture can accumulate on walls, causing unsightly damage that can compromise the neat and tidy appearance of your home. By choosing a backsplash installation, you can protect your home while also adding to its appeal. At our flooring showroom, we make it easy to design the ideal backsplash--yours! Our expansive showroom features samples of fine stone and marble backsplash tiles. Mix and match to create unique designs. If you aren’t sure where to begin, we can help you find the products that meet your needs. Design Potential: You have the perfect flooring and countertops--now what? Tile backsplashes can add a stylistic flair to spaces. Since these materials are available in different sizes and colors, you can create a pattern that goes well with your existing decor. Wall Protection: You spent a lot of time and resources finding the perfect shade of paint for your home. Imagine the grief that might arise if grease or pasta sauce ruined the glossy finish of your kitchen wall. Tile backsplashes can protect your walls from costly, time-consuming damage. Ease of Maintenance: It is much easier to clean up stone or marble tile than it is a bare, porous wall. Since tile backsplashes resist water and staining, all you need is a mild cleaning solution and cloth to clear away messes. Stone Backsplashes: Tile hewn from stone can impart a sense of timelessness to any space. 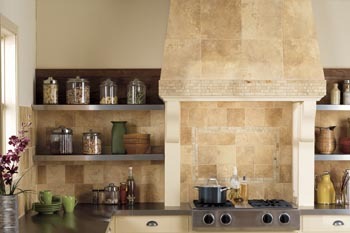 Our showroom features many stone backsplash tiles in a variety of colors, glazes, and finishes. Marble Backsplashes: Give your kitchen or bathroom an elegant, chic ambiance with our marble backsplashes. Marble complements countertops well, and also serves as a visual centerpiece with tiles of your choice. Whether your interior design goals incorporate a rustic charm or a commanding, Classical appeal, our showroom is here to help you attain them. Visit our showroom and discuss your project with our team. From start to finish, we’re with you at every stage of your project. Contact us to learn more about our backsplash tile options. We proudly serve property owners throughout Webster, TX, including Clear Lake, Houston, Nassau Bay, Sea Brook, and the surrounding area.